Learn tips and tricks for your eye makeup with Style Eyes by Taylor Chang-Babaian! This is the time of year that I start thinking about gift ideas - you won't find it surprising that most of the presents I give are beauty related but sometimes I have no idea what sort of makeup someone prefers so instead I give beauty books! 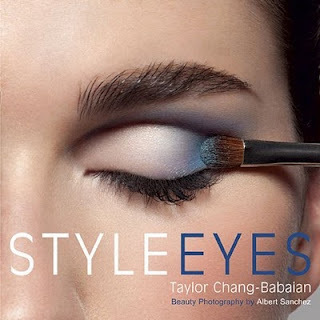 Style Eyes by Taylor Chang-Babaian - $17.95 - ISBN: 978-0-399-53596-3 - this is makeup artist Taylor Chang-Babaian's second book. Her first book, Asian Faces, focused on makeup for Asian women. Style Eyes is for women of all ethnicities and focuses on what most of us find the most challenging - eye makeup! This book is helpful whether you are a beginner or a pro - there are tips and tricks for everyone. The step-by-step instructions are excellent and easy to understand and there are very detailed how-tos for different eye shapes and lids which I think is something that many people find confusing. The most informative part for me was the tutorial on applying false eyelashes - which I now might finally be able to do with her help! Style Eyes also covers how to identify and use common eye makeup products and tools, eyebrow grooming, looks for day to evening and the best looks for every age and situation, from wearing glasses to achieving an eyelift and earsing lines without surgery. Have you been waiting for the NARS Bento Box!? Is it just me or do any of you also find the idea of having to get on a waiting list to BUY something crazy?! I understand that making something hard to get makes it more desirable - the capitalist side of me gets that - but the socialist side of me thinks that if you have the money you should just be able to just buy it, and they should just keep making them until everyone that wants one, has one! Rant over! NARS has caught on to what video game console makers have known for years - the best way to build up demand for something is to not make enough! Send out a few and watch the people fight over them! Or in the case of beauty products, make a few and watch what people will pay for them on Ebay! Bento Box Set - $125 - a limited edition set of two Kabuki cups that were hand-poured with a new exclusive-to-NARS lipstick formula in highly pigmented shades containing Vitamin E. Housed in a handmade bento box, the set also comes with a Kabuki lip brush, designed for precise application by dipping the brush into the cup and blending until desired coverage is achieved. It will be available Monday at Holt Renfrew and at www.narscosmetics.com - you can get on the wait list at www.narscosmetics.com/bento - you won't have to fight me for one, I'm not on the list! I'd be curious to know if any of you are or what your general opinion of beauty wait lists are! shu uemura Holiday 2010 - Abracadabra Fantasy - discover the magical powers of makeup! Reindeer Kiss xxxx Eye and Cheek Palette - $85 - inspired by the colours of a frosty winter land covered in crystalline snow that sparkles in the light. Bowwow! Magic Queen Eye and Cheek Palette - $85 - a warm-toned palette for a peaceful holiday season. Blush Tint - Miracle Cherry - $30 - a lightweight gel blush to instantly add a natural glow to your cheeks. Lip Duo Tint & Gloss - Love Apricot - coral beige tint and apricot gloss with gold and silver glitter or Harmony Pink - girly pink tint and vibrant fuchsia gloss - $45 - enjoy the matte finish of the tint alone, or add gloss to amp up a shine! Paint Crayon - Sparkly Purple - dark purple with sparkly gold glitters - $30 - waterproof, long-lasting and creamy mechanical pencil allows you to draw a defined line that can be blended easily right after application. High Performance Balancing Cleansing Oil Advanced Formula - $37 - shu uemura's signature cleansing oil. A gentle formula for moisturized, balanced, petal-soft skin. Cleanses gently and maintains the skin's moisture balance with Advanced HPO system, Asian botanical oils such as Camellia Oil and Ginger Root Oil. Leaves skin feeling comfortably balanced and petal soft with a fresh and sensuous aroma. Peace & Harmony Mini Brush Set - $85 - they're cute and pink, what more can I say?! Magical Windfalls - $36 - easy-to-wear partial lashes in black with some pieces pre-decorated with glittery and shiny magical hear and star symbols for cute accent. Premium False Eyelashes - $75 - a dreamy pair of cutomizable eyelashes! With a variety of abracadabra symbol stickers enclosed, create your very own pair of lases for the festive season. You can score yourself this collection now at Holt Renfrew! Christy Turlington Burns slated to be the latest Avon lady! Model and activist, Christy Turlington Burns has been tapped to be the face of the latest fragrance due to her timeless look and classic appeal. A dedicated advocate for women's health, Turlington Burns shares Avon's values and longstanding commitment to improving the lives of women on a global level. Christy Turlington Burns is the latest in a line of famous face to join the Avon family alongside the likes of Fergie, Reese Witherspoon and Salma Hayek. 5 comments so far. What do you think? Brighten your hands with La Roche-Posay and Avon! Nothing has the ability to make you feel older then looking down at your hands and seeing brown spots! Of course your hands get the most sun exposure and few people remember to apply sunscreen there so that doesn't ease the problem. There is help! Just keep in mind that if you are going to go to all the trouble of banishing the brown spots, you will have to remember your sunscreen or they will return! La Roche-Posay Mela-D Hands - 50ml - $18 - fragrance and paraben free, it contains Kojic Acid + LHA to help slough off dark, dead cells on the skin surface to promote a brighter and more even skin tone. I love the feel of this cream and how quickly it absorbs! I do have a couple of freckles on my hands which are still there, a little lighter but still there - but I do think my hands look brighter and more evenly toned and it's a good moisturizer. I think if I really wanted the freckles gone I would need to use this for much longer! Avon Anew Clinical Luminosity Pro Brightening Hand Cream SPF 15 - 75g - $15 - formulated with injectable-grade L-Aspartic acid to help inhibit pigment production and reduce the look of dark spots as well as visibly retexturizes skin's appearance for younger-looking hands.Dramatically reduces the look of creepiness and fine lines in just one week. I think having the sunscreen built into the cream makes all the difference with seeing results - it's so easy to forget and not having it undoes all the work of applying a lightening cream. It does take a little extra rubbing for it to absorb because of it though. Make Up For Ever makes Halloween easy! Make Up For Ever Tricks & Treats - $46 - Not everyone can have Christelle's naturally green complexion that lends itself so well to Halloween - the rest of us count on clever little kits like this one from Make Up For Ever that contains the 4 essential products to turn you into the ultimate Genie, Kitten and/or Fairy. Aqua Cream - a highly pigmented, waterproof cream colour to highlight your eyes and cheeks. Formulated with mother-of-pearl particles, it gives rich colour with a luminous finish in just one application. Aqua Eyes - a long lasting, waterproof eye liner that won't smudge or fade so you can party the night away! It can be used to apply a defined line or smudged for a smoky look. Get the look application steps and face charts are included on the back of each box to help you create the Halloween look of your choice like a pro - choose your favourite character or try them all! Perfumania's Kim Kardashian Fragrance Giveaway! Perfumania, the largest fragrance retailer in the US (and YES, they ship to Canada), has been busy revamping their website. The site has been redesigned in its entirety, to provide you with a more functional, personalized and simplified shopping experience. In addition, the site will also be offering social media capabilities, allowing you to link weekly deals and fragrances to your Facebook and Twitter! To celebrate the re-launch, Perfumania will also be featuring an exciting “What’s Your Favorite Fragrance?” sweepstakes through November 5. Users can simply register an account, submit the name of their favorite fragrance, and be automatically entered to win their favorite fragrance and a LED 46” TV! Some additional site features include: more ways to search, faster shopping and checkout as well as product recommendations. My good friend Kim Kardashian has also been busy since visiting me in Toronto - Tune in to NBC’s The Apprentice on Thursday, November 11 to catch a Perfumania-themed episode featuring Kim Kardashian. But you know I don't like y'all buying things, so how about winning Kim's fragrance instead? To celebrate the Perfumania.com relaunch they have kindly offered one of our readers a bottle of the Kim Kardashian fragrance, a nifty bag and a $25 Perfumania Gift Card! Want in? Of course you do! This contest is open to US and Canadian residents. All you have to do is join Beauty Crazed as a follower if you aren't one already. You can either do it through Google or through Networked Blogs on Facebook - you can find both signups on the right hand side of the Beauty Crazed site. Once you belong to our crazy family just leave a reply to this post letting us know you want in and what fragrance from the revamped Perfumania site is tempting you the most! If you give the contest link a tweet and/or post it on your blog, there's an extra entry in it for you! Including an e-mail address would be extra helpful and you can write it like this - info(at)beautycrazed(dot)ca - so the bots can't find you but we can. If you prefer not to leave your info on a public post, please leave a post saying you want to enter and then e-mail us your info - info@beautycrazed.ca, please put "Perfumania Contest" in the subject line. Winner to be decided by random drawing and you have until November 12th to enter. 108 comments so far. What do you think? MAC 'Tis Noble to Give spreads the true meaning of the holiday season! Available at MAC Retail Stores only! Tartan Tale cards - good for year round giving - were created by kids affected by HIV/AIDS with all proceeds going to the MAC AIDS Fund. MAC A Tartan Tale has my two favourite things - plaid and palettes! How will I ever decide?! Now confess, what did you get/have your eye on? MAC has A Tartan Tale to tell for Holiday 2010! The holiday collection season really starts for me when MAC puts theirs out and I am loving everything this year! I will definitely be running to my MAC counter tomorrow at lunch to check it all out in person - until then, admire the pretty pictures! What's on your MAC Tartan Tale wish list? Don't miss the Marcelle Warehouse Sale! You do not need a special card or invitation to attend - the sale is open to everyone! Feel free to pick up something for your favourite blogger (and get something pretty for yourself too)! La Mer has great gift ideas for Holiday 2010! It's cold enough outside now that I don't mind talking about the holidays - it sure is starting to feel like winter! Which is good because a line I adore, La Mer has introduced their holiday offerings - love them ! The Lip Balm - $65 - goes glam for the holidays with a classy silver toned cap. Fortified with a potent concentration of La Mer's original Miracle Broth, this balm will soften roughness on contact, relieve discomfort and help seriously dry lips. Perfect for the lip balm addict on your shopping list! The Essential Body Collection - $340 - La Mer's signature body treatments all together in one happy place: The Body Refiner - 200ml, The Body Crème - 200ml, The Hand Treatment - 30ml, and The Lip Balm - 9g Anyone (including yourself) would be thrilled to receive this! The Hand Treatment - $100 - the perfect gift for those impossible to buy for people, who doesn't love an ultra luxe hand cream?! Sets are available in limited quantities and you can find everything here at Holt Renfrew. Bring warmth and happiness to a woman in need and give your clothes a new lease on life at Jacob! Nothing makes me happier then the opportunity to combine my love for shopping with charity! Jacob and Jacob Lingerie has launched a new campaign, in collaboration with Goodwill in Ontario and Western Canada and Renaissance in Quebec and the Maritimes - "Give your clothes a new lease on life" to do just that! To help meet their goal of collecting 50,000 articles of clothing before December 24th, Jacob wants you to go through your closet and bring in the clothes you aren't wearing - in return they will give you a 25% discount on any regular priced Jacob or Jacob Lingerie item for every article of clothing donated - everyone wins! What are you waiting for, get shopping! Nicole by OPI knows that the holidays are no time to be demure with your nails - turn your holiday nails up a notch (or two) with these festive hues! Keep an eye out for my swatches next week! Can't commit to just one or looking for a perfect stocking stuffer? Tinsel Tips has the three reds in mini sizes as well as jewel nail decals - all for only $10! You can find the Holiday Magic collection starting in November at select Shoppers Drug Mart, Walmart, Loblaws, Jean Coutu, Uniprix, Katz Group and London Drug stores across Canada. LUSH celebrates the Day of the Dead! Calavera Bath Bomb - $5.95 - Spanish for "skull", Calavera's fragrance is inspired by traditional Mexican cooking and celebrations with lime oil and Mexican marigold petals. Lady Catrina Soap - $5.95 - yes, that is a hat! This soap is inspired by the lady Catrina, an iconic image for the Day of the Dead celebrations. It has the same fragrance as the Calavera bath bomb that is fresh, zesty and uplifting! Calacas Shower Jelly - $4.95 - Calacas is Spanish for skeleton represented by these colourful dancing jelly skulls. In three colours: orange, green and jello , each one is scented with the invigorating scent of lime and neroli and infused with aloe vera gel to soften your skin. Hard Candy re-enters Canada - finally! Calvin Klein BEAUTY - Contest! It's Clinique Bonus time at Holt Renfrew! Belle D'Opium - a new take on an old favourite! Make Me Young - Contest! Gucci Cruise 2011 Ad Campaign - Still Hot! Leah Miller SYTYCDC dress watch - October 6 & 7! True MediSpa helps you relax and rewind (time)! Come be a NeoWoman with Vichy! Canadian event! Vera Wang celebrates 20 years with Anniversary! Elle Canada shows Beauty Crazed some love! Giorgio Armani (and Megan Fox) have Eyes To Kill! Rise & Shine for a future without breast cancer!